Home How to How to add RBL on Zimbra Server? A DNS-based Blackhole List (DNSBL) or Real-time Blackhole List (RBL) is an effort to stop email spamming. It is a “blacklist” of locations on the Internet reputed to send email spam. The locations consist of IP addresses which are most often used to publish the addresses of computers or networks linked to spamming; most mail server software can be configured to reject or flag messages which have been sent from a site listed on one or more such lists. The term “Blackhole List” is sometimes interchanged with the term “blacklist” and “blocklist”. A DNSBL is a software mechanism, rather than a specific list or policy. There are dozens of DNSBLs in existence, which use a wide array of criteria for listing and delisting of addresses. These may include listing the addresses of zombie computers or other machines being used to send spam, ISPs who willingly host spammers, or those which have sent spam to a honeypot system. Since the inception, Zimbra has been a community. All of Zimbra Collaboration Open Source Edition software, documentation and innovation has been created, tested, used, and discussed openly by people like you participating in our Open Source Community. It’s contributors diagnose bugs, fix bugs, translate programs, submit patches, point out deficiencies in documentation, answer community questions, submit killer applications, alert Zimbra to something that needs tweaking, and write new software. No matter how you contribute, Zimbra welcomes new ideas and contributions for the advancement of greater shared knowledge and a better Zimbra Collaboration product. 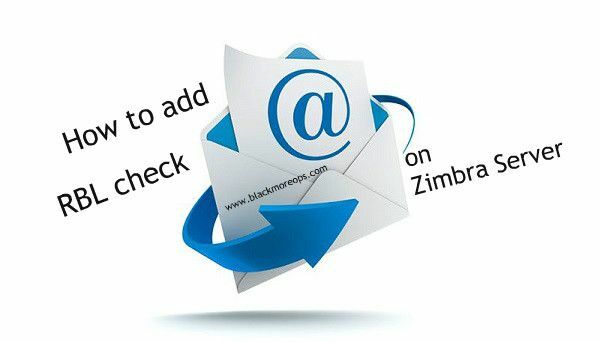 Login to email server and su youreself to zimbra user. Currently reject_non_fqdn_sender and reject_non_fqdn_sender is set. I used \ to break the lines. You can do it all in one line if you feel like. $ zmprov mcf zimbraMtaRestriction reject_invalid_helo_hostname zimbraMtaRestriction reject_non_fqdn_sender zimbraMtaRestriction "reject_rbl_client cbl.abuseat.org"